The date was mid-July 2009. I was jogging around 4pm in the afternoon on the Northeast side of the mountain. About 40 yards ahead of me, I saw a man in a Confederate military uniform on horseback. The entity appeared for a few seconds and disappeared into the tree line. As I approached the location of the entity, I noticed that there was nowhere for the man or horse to go. It would have been impossible for them to move into the dense foliage as swiftly as they did. I stopped and looked for a while and examined the area for any sign of them. I did not see anyone in the area or anyway they could have gone. To this day when I jog on Kennesaw Mountain, I always glance at that same location in wonder. In Sept. 2015, my son and I were hiking towards the Illinois monument. It was a sunny Tuesday and we came from the Cheatham Hill Road parking lot, passing a group of firefighters as they were leaving (obviously a workout). There were no other hikers that we saw, but as we approached the bottom of the hill (where the Union soldiers staged before the battle) I kept hearing a yelling sound from the woods every few minutes and expected to come upon kids at any moment. We took some photos at the bottom of the hill on the bridge and for some reason I decided to record on my phone (just audio) on the way up the hill. Periodically over the past two years, I've listened to the recording and even had a local historian take a listen. He did not hear anything like an EVP, but I can hear, CLEARLY, the following: at the bottom of the hill, there is an EVP of a woman laughing and a man saying, "There's something I don't trust." As I walk with my dog up the hill, I recall stopping to allow the dog to sniff, and a deep man's voice on my recording says, "Dog." Halfway up the hill, I ask my son, "Do you hear a voice yelling?" and just before he replies yes, there is a little boy voice that says, "Them soldiers is dead." And perhaps an unintelligible female voice, but am not sure. I am a writer and editor, and I can truly say that I could never even think up the grammatically challenged phrase, let alone know how to fake it on my phone, which I didn't even realize I could turn up the volume on for months after my first playback of this recording. Subsequently, I have heard another deep voice repeat the word "hear" at that time in the recording (repeating my word). When we got to the top of the hill, my son was bent down looking into the tunnel at the top and I was standing up, recording, but had told him not to go in, he'd be bitten by a spider or something. There is another EVP at that moment which is the same little boy's voice that says, "What's that?" My theory is that he wondered what my cell phone was. Another theory is that the deep voice saying, "Hear" was perhaps a spirit picking up on the fact that I could hear the calling, disembodied voices from the distance. We headed back down the hill that day, only passing one couple with a teenager hiking towards the monument. I asked if they had seen children on the trail or anyone else, and they said no, they had not. My husband, a retired Marine, and I were eating dinner later that year at a local restaurant and decided to go back together, even though he's a skeptic. We got there on a drizzly summer evening just before sunset and it was quite busy with hikers just finishing up. We went down to the bottom of the hill and the first thing he said was that he smelled "wet canvas" like wet canvas tents. I didn't smell anything, but then I've never smelled wet tents... He then walked back up the hill towards the vehicle, but I lingered, taking some photos. I didn't hear or see anything or get anything on photo, but on my way back up the hill had an "experience." Initially, I thought I was just out of shape headed up the hill, but now, looking back, I realize it was something else. As I walked slowly up the hill that evening, my breath became very short and my anxiety was heightened. It was like I had just run five miles, fast. I actually had to stop and lean on a post at the top of the hill. I had never experienced this before, though I'm 55 (female) and in pretty good shape. I left thinking I really need to start working out more. But when I went back another day and hiked down and back again, I experienced not even a shortness of breath. I believe I was experiencing the anxiety and physical symptoms of perhaps some of those who charged up the hill that day in 1864. Please note, I did not attribute the feelings to anything supernatural or spiritual that evening...it wasn't until later the realization came. I have been hiking the park for 28 years, and have definitely had feelings at certain spots on the trails before. I've taken multiple photos before (like on the field of flags/Kiwannis day) and had similar feelings of reverence. But my recording, to me, is clear. I believe, and also think that if you want to believe, you can hear things, but if you do not want to believe, you can't hear the clearest of EVPs. If you are not open to it, you won't hear it. And if they know you can hear it, you start hearing more. I have mixed feelings about messing with this, and believe this is not something to be played with. Period. Have reverence, have appreciation for the sacrifices, and don't mess with what you don't understand. I admit, the historian with whom I shared my recording probably thinks I'm crazy, but even after he said he hears nothing, I know I hear it. I am a journalist, by the way, and truth seeker. I was jogging at the time, so I had no way of capturing the image by camera. That being said, the way I reconciled it mentally is by chalking it up to the fact that I was about 4 miles into a 5 mile jog, I was exhausted and likely hallucinating. All I know is that I did see something that resembled a soldier in gray on horseback. Do you have ANY type of evidence? Pictures, Video, etc. 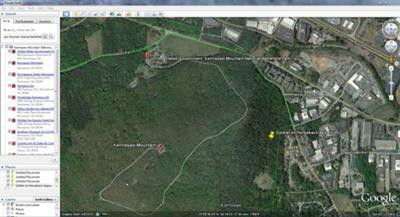 I love walking all around Kennesaw Mtn, Lil Kennesaw, Pigeon Hill, Cheatham Hill, everywhere around there. I have NEVER experienced ANYTHING ghostly. I would sincerely LOVE to see a Confederate or Union soldiers ghost; but I am afraid they are NOT THERE.